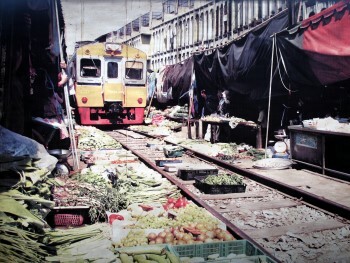 Looking for the famous train that goes through Bangkok market? 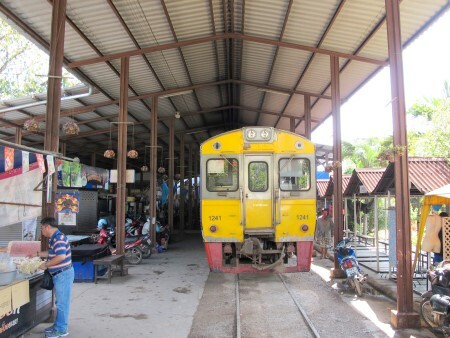 Then you will have to travel out to Mae Klong Railway Station. 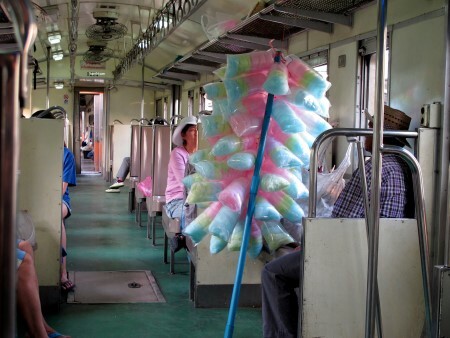 The most interesting way to travel to the Bangkok train market is on your own tour. You can board one of the commuter trains that are running on the Mae Klong line and have an interesting journey out to the market, rather than going on one of the organized tours that lets you enjoy Bangkok's often horrendous traffic jams, from the seat of a cramped minibus..
To check for any updates to the timetables you should visit the State Railways of Thailand official website before you travel out to the market (search for the BanLaem-MaeKlong Line Timetable). 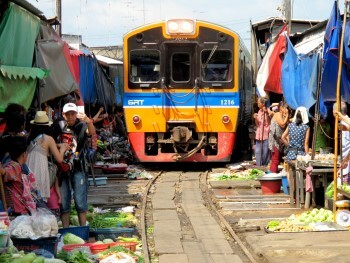 Trains to Maeklong don’t leave from Bangkok main train station (Hualamphong), but from Wongwian Yai Train Station. In Bangkok you can also choose to board your train at Talat Phlu Train Station which is around 1.5 km away from Wongwian Yai. If you don't want to take the train, you can also use a minivan or private transfer (from your hotel) to get to Mae Klong. 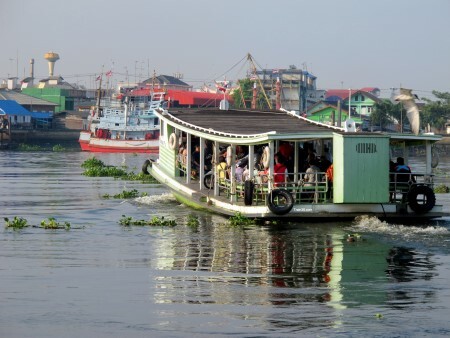 The Mae Klong line runs for approximately 70 km from Wongwian Yai in Bangkok (on the left bank of the Chaopraya River), to Mae Klong in Samut Songkhram (สมุทรสงคราม). 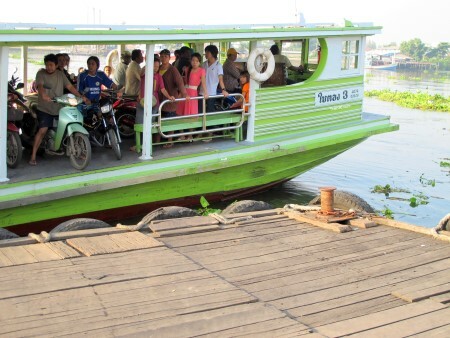 It is used daily by locals to commute from Samut Sakhon and Samut SongKhram (South-West of Bangkok) to get to the Thai capital. It is also used by Thai and foreign tourists to go to visit the famous Mae Klong Train Market, as well as the nearby Amphawa Floating Market. 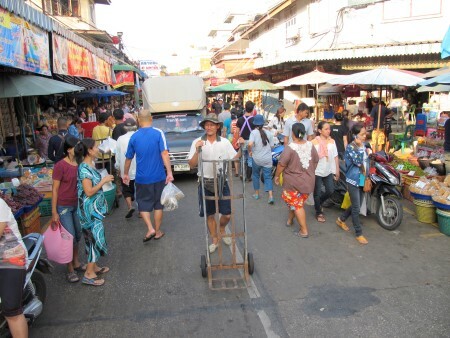 The market is open everyday from 07:00 until 16:00. 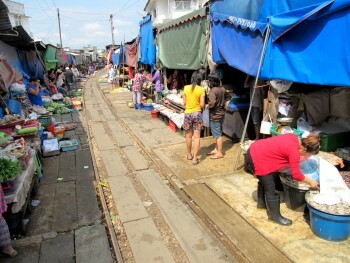 There is no entrance fee to the Maeklong Railway Market. The commuter trains that run on the Maeklong railway line are very slow (average speed 30 km/h) but also really cheap. The total cost from the origin station of Wongwian Yai to Maeklong train station is only about 20 THB! There used to be Air-con coaches running on this line but at the moment there are only fan cooled coaches. Maha Chai (มหาชัย) is a small fishing town located by the Tha Chin River and is worth a visit for its market and its atmosphere. 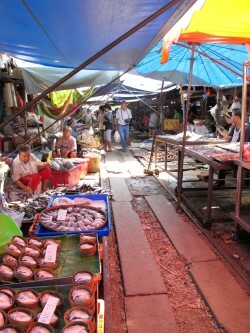 There are market sellers displaying their products (fresh veggies, fruits, seafood...) along or even directly on the railway tracks and once a train approaches the vendors swiftly clear the tracks to let the train pass by. 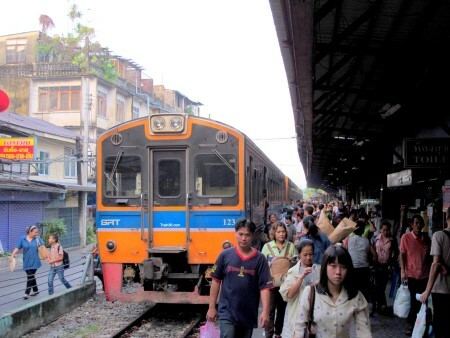 Every day there are many commuter trains going to Maha Chai and many commuter trains coming from Maha Chai. Warning: If you go to Maha Chai in order to visit the “Train Market” make sure to check at what time the next train from Ban Laem to Mae Klong is departing as there are only 4 daily trains running on the 2nd section from Ban Laem to Mae Klong. You should also take into account that you will need altogether around 15 – 20 minutes to cross the river and reach Ban Laem Train Station. The walk from Maha Chai Railway Station to the Ferry boat crossing pier takes about 5 – 10 minutes. It takes around 5 minutes to cross the river and a ticket costs just 3 THB. 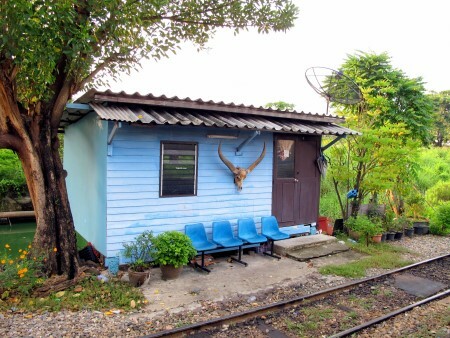 Ban Laem is a very small station but not without a certain charm. 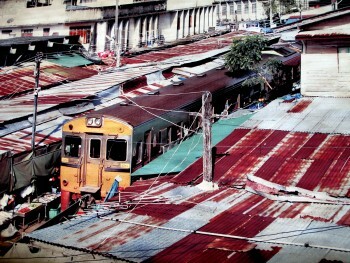 There are only 4 daily commuter trains running from Ban Laem to Mae Klong. 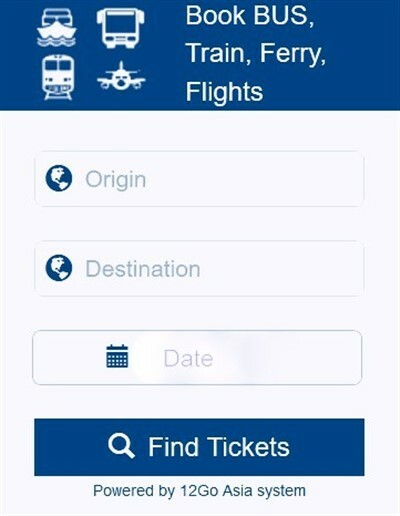 The photo above is now out of date and departure times have changed a little and now there are 4 services a day in either direction. Since this line was upgraded in 2016, it is also much quicker, taking just an hour to get to Maeklong Station. 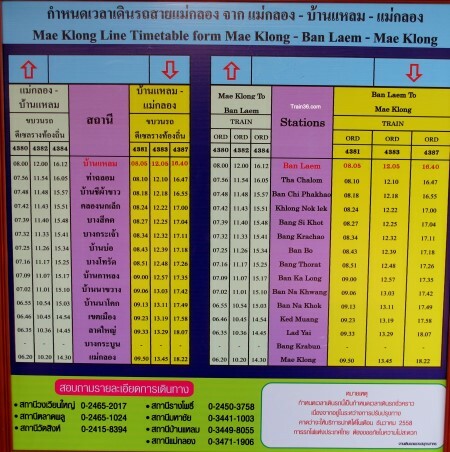 The new Mae Klong train timetable for 2018 is below. 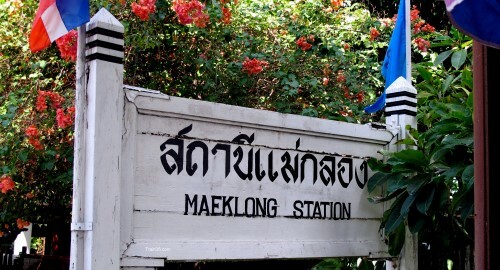 New Ban Laem to Maeklong train schedule. As we already wrote, you should plan your trip beforehand and give yourself enough time to reach the railway station in order not to be left stranded at Ban Laem. 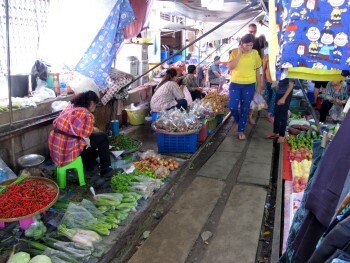 Mae Klong Train Station is unique as it also operates as a fresh food market (veggies, fruits, all sorts of seafood and fish…). It became world famous for the spectacle it offers many times per day, when market stalls have to be quickly removed from the railway tracks to give way to one of the oncoming trains. There is no entrance fee to pay to enter the market. The approaching train blows its horn to signal its imminent arrival, but the market vendors don't bother clearing the track until the last minute and the 2nd horn! 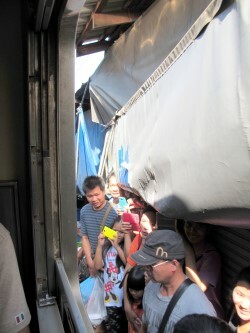 As soon as the train is gone the stalls and products are moved back on the tracks as if nothing happened! 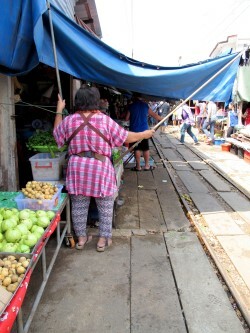 Actually the Thai name of the market is “Talat Hoop” (ตลาดร่มหุบ) which literally means the “Market Closed Umbrella”. The name comes from the fact that while a train is approaching vendors hold on to the poles that support their canopy roofs and wait till the last moment to give way to the train! Obviously the train is running at low-speed, but it is still impressive as it almost touches the market stalls and different products that have been removed just far enough to let the locomotive and coaches squeeze through! 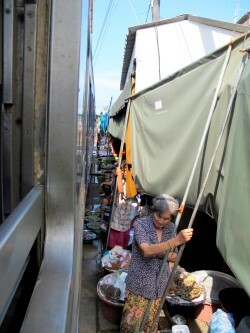 When coming by train from Ban Laem as you approach Mae Klong you will be able to observe by the train windows: market stalls, umbrellas, house walls that are being brushed past by the running coaches as well as people that awkwardly stands waiting for the train to pass them by or taking pictures of the spectacle. 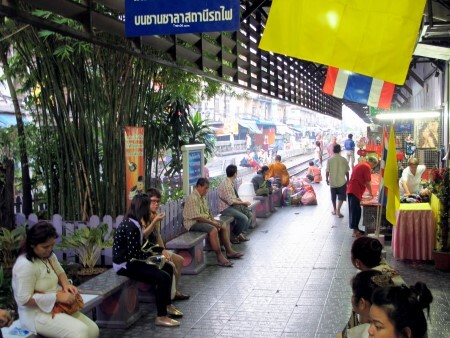 There are only 4 daily commuter trains running from Mae Klong to Ban Laem. Please check all train departures with Thai Railways before you set off on your journey as times do change. We thought that the “Bangkok Train Market” was kind of a tourist trap, but maybe it is just that we have been in Thailand too long!. It is pretty crowded with foreign tourists that are wandering the market and trying to position themselves to take pictures of one of the 8 daily trains that arrives and departs at / from Mae Klong railway station. 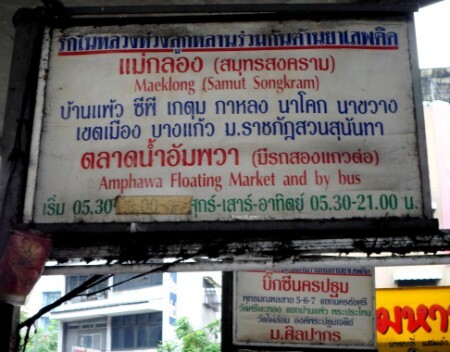 The package tours “Mae Klong + Amphawa Floating Market” probably sell like hot cakes at any Bangkok travel agencies. For us, by far the most interesting part of the trip was the commuter train trip to get there, as it provides a good and authentic Thai experience and nice scenery. However, many people seem to enjoy this day trip from Bangkok. The other interesting part of the trip is the fishing town of Maha Chai, for its lovely and alive market streets and its atmosphere. 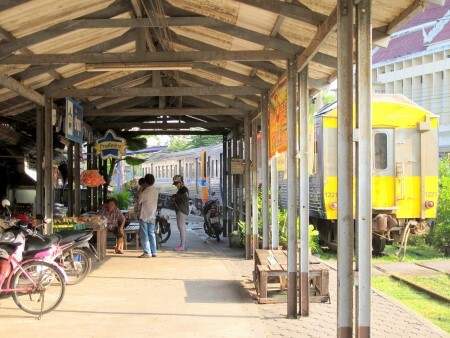 These days a lot of tourists are actually travelling by vans or buses all the way up to Mae Klong or choose to hop on the train at Lat Yai or Bang Krabun which are the last two stations before the “Train Market”. If you do that, in our opinion, you are actually missing the best part of the trip! As you are getting closer to the train departure time, note how the market transforms itself and enjoy the spectacle offered by the vendors that remove their stalls in the blink of an eye and hold on to the poles of their awnings until the very last minute to let the train sneak in. Because there are so few trains running on the Mae Klong – Ban Laem section of the line and because there aren’t any evening trains, many people choose to go back to Bangkok by minibus / van. It costs around 80 THB and it takes approximately 1 hour 30 minutes to reach the Thai capital. If you choose to go to Maeklong Market by minibus instead of going by train, you can always use the minibus service at Victory Monument (now moved to Morchit Bus Terminal). As shown on the picture above the 1st van leaves at 05:30 and the last one at 21:00. 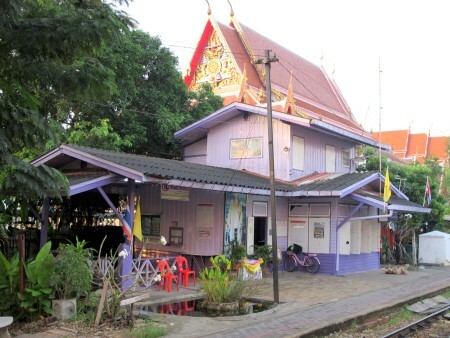 There is also a minibus service running from the Southern Bus Terminal known as Sai Tai Mai to Mae Klong (60THB). 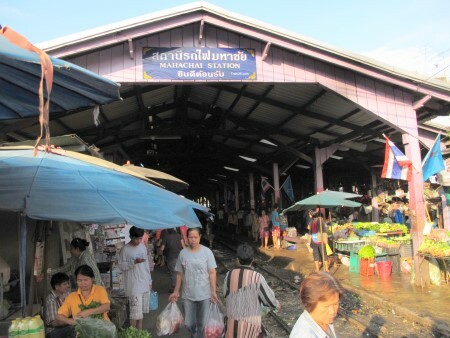 A lot of people who travel to the “Bangkok Train Market” also choose to visit the nearby “Amphawa Floating Market”.